Don hasn't kept any pets since he retired from farming. "No sense in trying to take care of another living thing," he says. And since his wife left, thirty-five years ago, he's lived alone. Although he sold off the last of his beef stock months ago, years of farming are deeply ingrained. His bones wake him before the sun, urging him outside. He goes through the motions. On a January morning, before the birds start to chirp, he smoothes a comb through his thinning hair, throws cold water onto his face and lights a fire to boil coffee. In a few hours he's outside contending with the weather, the kind with air bitter enough to sting your lungs and a reflecting sun that could set fire to your corneas. He's splitting logs, not because he didn't fill the woodshed that fall, but because it is work to fill his day. Years of unaided practice have perfected his form. With a single stroke he cracks his ax clean through the log, turns the wood ninety degrees, and repeats the motion. Warm, damp air billows from his nose and immediately freezes onto his beard. When streams of snow float from the sky, Don calls it quits. Living this long has taught him his limits. Once inside the farmhouse, Don drops an armload of snow-dusted timber into a wood box and pulls a chair from his kitchen table to his woodstove. Heat radiates from this point in the room, but fails to reach the corners of the house. For this reason, Don keeps to the center of his home. He bows down, slowly lowering himself. Once his fingers thaw and are able to bend again, he removes his shoes. Then, just as carefully as he seated himself, he removes his wool socks. He drapes them over the back of his chair to dry. His breathing calms, becoming as steady as the fire in front of him. When Beverly left him, so long ago, he didn't pursue her. He figured if she left of her own volition, then she needed to go. In truth, he didn't know why she'd vanished. In his mind, there was nothing that needed changing. It wouldn't help any to tell her things would be different if he didn't know what to mend, didn't know how to make her happy. It was better he left it alone. Anyone who thought Don abandoned his devotion to Beverly was wrong, but no one was foolish enough to think that. Once she was out of the house, Bev wrote letters regularly, giving him updates on her life. Eventually, divorce papers came. Travis, Don's neighbor, suggested he have a lawyer look at them, but Don couldn't imagine that would help anything. He read through them, signed on the lines where she had penciled in delicate Xs and sent the papers back straight away. "Can't change what Bev wants," he said. After the separation was official, Bev continued sending letters in her attractive handwriting, telling Don about a new dress, sharing a favorite pumpkin pie recipe, and eventually telling him of her new husband, her children and her new life. The return address placed her just out of Verndale, less than eight and a half miles away. She never made an apology, and Don never expected one. He doesn't keep the letters, and he doesn't respond. When they arrive, he reads them once, copies the recipes if she sends any, then folds them in half and tosses them into the woodstove. Once a week he drives into town to visit his niece Claire, usually while her kids are in school. All that energy makes him uneasy. "You need a hobby," Claire tells him. "Maybe whittling or something." "Not every old man whittles," he says. "Besides, I do enough woodwork. I chop it into pieces and burn it." "That's not what I meant," Claire says. She cuts him a thick slice of blueberry pie and serves it with milk. "I just mean you have a lot of time to kill. Why don't you go on vacation, use some of the money you've saved?" "Why don't you go on vacation? No reason for someone young as you to stay in a town small as this forever." Claire rolls her eyes and forks a bite of pie into her mouth. She's not that young anymore. Married with kids old enough to attend high school isn't exactly young and free. "How's your godmother?" Don asks. "Bev's fine and she probably wouldn't mind if you said hello," Claire says. "Why would I do that?" Don asks. "Because you want to," Claire says. "Damn good pie," Don says, squishing crumbs under his fat thumb. After leaving Claire's, Don makes his weekly stop at the Kitchigami Regional Library. It's a quiet place, a perfect place to keep from being bothered. He enjoys checking the Farmer's Almanac. And sometimes, sitting in a chair too long with a thin agriculture magazine in his weather-cracked fingers, he slowly drifts off to sleep. Now, walking aisle after aisle, the uncarpeted floor wincing under his steps, he wonders if his niece is right. A hobby wouldn't hurt him. He chuckles at the thought of whittling, his smile pushing lined cheeks up close to his eyes. Perhaps to humor Claire, he searches for a book on the subject. Just flipping through one makes him uneasy, reminds him of his age. He closes it abruptly and returns it to the proper shelf. Searching through the library catalog again, running his broad fingers over tattered index cards, he finds a book on woodworking of a completely different kind. 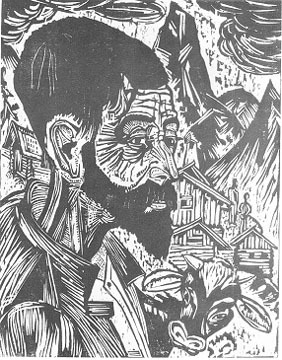 He copies down the title, The Complete Wood Relief Print. Back home, he rests in a chair at his kitchen table and opens the book. At first, he pages through quickly, not reading, just looking at the pictures. One of the few color prints, Picasso's "Woman with Hat", startles him. The bold primary colors are bright, almost offensive. He goes on, admiring Ernst Kirchner's black and white "Alpine Shepherd." Impressed by the technique, he continues. There are colorless step-by-step photographs of the Japanese method, and the reduction print method. Reading the types of wood suggested causes a tickle to climb in his throat. He already knows more about the characteristics of wood than any book could teach him. Pine, he thinks, would be best for basic carvings. It's easily bruised. But he knows something the book doesn't. Maple, because of its strength, would be necessary for fine detailed work. Toward the end of the book, he comes across a monochromatic print that stops the breath in his throat. Edvard Munch's "Two Beings" depicts a man and woman from the back. The woman is standing to the left, dressed in white, her hair reaching almost to her waist. The man, a step or two behind her, is in black, his body turned slightly toward her. They have been carved forever in this position, unable to touch each other for eternity. Don closes the book and gets up to stoke the fire. He throws in a couple logs, poking and turning them with iron tools. Orange sparks fly, reminding him of the knotty pine he got last year. Every single piece of it popped and crackled, flinging coals against the glass door of the woodstove. He sits back down at the table and makes a list. He'll need thick paper, tins of black ink, hand rollers, carving utensils, smooth boards of maple, and a press. Ready to get started immediately, he drives to town again. The gears of his truck grind against the cold as he forces them into new positions, but he gets to his destination nonetheless. Hands jammed into his pockets, he walks around the art supply store until the owner approaches. He keeps his eyes lowered, uses the term `Miss' when showing his supply list to the woman. "I can get you the paper and ink. Let me see what we've got for engraving tools," she says. She disappears down an aisle and returns moments later empty handed. "It's best to just order them. I'm putting one in this week. As for the press, let me check with our suppliers." Don thanks her and leaves with his few supplies. The next stop is the lumberyard, which is easy enough. He orders the maple, picks up a few clamps. After the trip to town, Don is as restless as night crawlers in a storm. The maple is ready in a day. The press is ordered from a company out of Chicago and he has to wait a full six weeks for it to arrive. In the meantime, he transforms his extra bedroom into a workshop, hanging hooks on the wall for his rollers, filling drawers with chisels and v-shaped gouges, and shelving planks of wood. A solid worktable sits in the middle of the room, edges lined with clamps waiting for use. "You've sure finished this in a hurry," Travis says, running his hand across the table. "Think you're really going to use it?" "When the press comes in, I'll show you," Don says. "If you get any free time, maybe when you're not busy scraping wood all day, could you come over and look at our pump?" Travis asks. "I thought it froze up, but I've had a heater on it all morning. Haven't had running water yet today." "Free time?" Don snorts, and slaps Travis on the chest. Then he stops. "Christ, what've you been doing over there without water? Suppose Abby wants to shower or cook?" "You think I haven't had an earful all day?" Travis asks. "If she didn't get after you, I don't think you'd get out of bed most days. Let her clean up and cook here. I'll take a look at the pump." During the six weeks it takes the press to arrive, Don begins to carve. He locks a piece of maple in place and, using a mallet, pounds a v-shaped tool through the wood, creating rough, jagged gouges. "Now what in the hell is that?" he asks himself. The wood is as tough as he expected, but he overestimated his ability to cut it. Forcing the tool against the lumber again, he makes similar serrated cuts. "Doesn't look much like anything, let alone a goddamn song sparrow." One last attempt produces much of the same. Reluctantly, he makes a second trip to the lumberyard, and returns home with planks of soft pine. Sharpening his tools, he prays for some control. He fastens a board to the table and applies a straight edged knife at a slight angle. A curve appears in the wood. He turns his knife, angling it this time in the opposite direction and cuts a parallel line not more than a hair's width from the first. He gently eases out the shaving he's just cut from the wood. Quite pleased with himself he makes another cut. It comes out effortlessly. He goes again and again slashing the wood here and there, changing tools, applying different amounts of pressure. Each line is beautiful, but they don't add up. When he finally sets his engraver down, his hands throb. Massaging his palms and knuckles helps with some of the pain. The print, however attractive each line, doesn't look like much of anything. He calls it quits for the day. In the morning, pain cleaves to the bones in his hands. They're stiff and sore, barely able to wrap around a cup. He shakes out a couple of aspirin and washes them down with coffee. Hanging two towels outside, he surveys the bruised sky, deciding it isn't much of a day to be out at any rate. He slathers on thick mentholated cream, covering each finger, and wraps his hands in towels warmed by the fire. Once the heat is gone, he switches to the frozen towels he hung outside and lets the discarded towels warm up again. This is how he spends the day, administering a rudimentary treatment, alternating between warm and cold, speaking to no one. The next day brings more promise to his new skill. His fingers work again. While waiting for the sun to rise, he scatters a bag of apples in his front yard for deer. "Scavengers need something to live on," he says to himself. Last week, Bev's brother died. He was her only sibling and Don suspected it hit her pretty hard. Don avoided the funeral, had Claire send a card. It isn't that Don wants to keep away from Bev; it's just that he wouldn't know what to do if he saw her. After a breakfast of back pork, fried eggs, thick toast and milk, he starts his work again. Before cutting into the wood, he tries to pencil in a picture of a dog. The problem is he can't draw one. "To hell with this," he says, throwing the pencil across the room. He can't carve freehand, and he sure as hell can't draw. He picks up the phone and dials. "Claire," Don says. "You always liked to paint." "Good morning," she says, yawning. "Could you draft a couple copies of animals for me?" "Why are you calling so early? What're you talking about? Draft animals?" "Could you draw some animals for me? Birds, horses, I don't know. Whatever you can." "I'll call you in a couple hours." Claire arrives at the farmhouse mid-afternoon, asking for a drink. She's asked for a drink for the last six years, even though she's been sober for ten. When Don leads her to his workroom, her eyes spring open. "What on earth are you doing in here?" she asks. "Hobbying," he says. He pulls out a carved plank of pine and shows her the piece. "A bit abstract," she says. "That's right. You draw me some animals on the planks and I'll carve them." Don pulls a clean square of pine from the shelf and locks it in place. "It's like this," he says. With one swift movement, he gouges a tidy line into the wood. He cuts a few more, until Claire's face expresses astonishment. "You're serious," she says. "I guess I can draw something for you. What do you want?" "Anything. Anything you can think to put down. Put it right here on the slab." Claire sends Don out of the room and gets to work sketching chickens, children with balloons, the moon, a slice of cherry pie. When she's finished with the pictures, she yells to Don, who promptly reappears at the door. He lifts the wood close to his face, inspecting each one closely. "It'll do," he says. "Now, this is what I really want." He pulls a picture of him and Bev from a drawer. "Draw us when we were happy." "I don't know Don," Claire says. She focuses on the cuff of her shirt. "I don't think you ever were happy." "Well, then imagine it and draw us that way." "I need to get home. Kids are out of school by now. Probably trying to kill each other," she says, making her way to the door. "Claire," Don says. "I'm not twisting your arm here, but I want you to do this for me." "Call me tomorrow, but I'm not promising anything. And if I do draw it, it probably won't look like either of you anyway." "All the better," he says. "You won't feel like you're filling an old man's heart with broken dreams then, just drawing two strangers." "Please," she says rolling her eyes. Don spends the next day repairing fence with Travis. Restringing barbed wire is a never-ending job. A person might think the wire to be wing bone fragile, the way it breaks and coils all the time. But it's not. The problem is the strength of the animals. "What're you really doing with that workshop of yours?" Travis asks. "Can't spend all day doing your work," Don says. He laughs hard enough to miss the nail he was supposed to hammer. He smashes his finger, but doesn't make a sound. Purple fills his face. They finish fencing around dusk. Claire is at Don's, already steeping tea she brought herself when he gets home. "Thanks for stoking the fire," he says. He pulls his hand from his glove and examines his finger. It has swelled as much as it is going to. The pressure feels like it will blow the nail right off. "What's wrong with your hand?" Claire asks. Without answering, Don goes to the garage and returns with a hammer and a jar of screws. Grabbing a clean dishtowel, he tells her about hitting his finger. He takes a screw, lights a candle, and holds it in the flame for a minute. After letting it cool, he gives it to Claire. Don places his hand palm down on the table and Claire, knowing exactly what to do, holds the point of the screw to Don's fingernail. With his free hand, he gently taps the hammer to the screw until it just barely punctures his nail. Blood streams out and Don wraps his hand with the dishtowel. "It will be," he says. "I'll do it. I'll draw your picture," she says. Claire sits at her worktable and begins drawing again. She banishes Don from the room. After drinking down a half-pot of coffee, he begins to pace outside the workroom door. "I can hear you," Claire says. Don goes outside. He begins to shovel snow in the dark, hand still wrapped. "This is heart attack snow," he says to the air. The press arrives a couple weeks later in a giant box, fully assembled. Well, mostly assembled. "Looks like a goddamn coffin," Travis says under his breath as he watches the deliveryman dolly it into Don's workroom. Don signs the papers, grabs a hammer, and starts to pry loose slats from the box. Minutes later a grand etching press stands in front of them. With a few adjustments, including putting the top steel roller in place, Don is ready to print. He places a block, etched side up, on the press bed. Carefully, he covers it in a thin layer of ink. On top of that goes paper, then he cautiously rolls the steel cylinder over the whole thing, pressing the paper firmly to the inked block. "That," Don says, pulling the paper from the block, "is an extraordinary print." "That's a chicken," Travis says. "It's a black and white picture of a chicken." "Take it home to Abby," Don says. "Go on. Take it." "What's she going to do with a picture of a farm animal? A bad one at that?" "She'll frame it," Don says. Once Travis leaves, Don pulls out the plank drawing of him and Bev. It's incredibly simple, just two people standing at a river. As Claire predicted, it doesn't look like either of them, but that doesn't matter to Don. To him, it is them. It's the way they were. The flow of the current is made of beautifully thick, curved lines that almost coil at points. He hasn't been able to carve it yet, as if carving it would start something inside him he couldn't stop. He secures the plank in place and gathers his tools. Picking up the engraver, his hand trembles. He touches the tool lightly to the wood, but can do nothing to force any pressure. Sitting for a while in that position, bent over the worktable, tool in hand, he realizes he can't do anything. The next morning, he sleeps in. Finally getting up, he rubs his eyes. He walks to the living room window and watches for birds. They hop from branch to branch like their toes are on fire. He sits down next to the phone. After thinking briefly about what he'll say, he picks up the receiver and calls Claire. He invites her over for breakfast. When she arrives, too late for pancakes, Don takes her urgently to his workroom. "Is something wrong?" she asks. He pulls the plank of him and Bev out again and shows it to Claire. "What? Do you want me to redo it?" "Just be here," he says. "Just sit here, so I can carve this. Just be here and watch me." "Of course," she says. "Take your time." Don locks the board in place, as he has many times before. He grabs a single edged knife and draws it near the picture. He traces the lines an inch in the air, but can't get himself to make a cut. He switches tools and repeats. This goes on for some time. As he grabs a v-shaped gouge, Claire tenderly places her hand on his. Saying nothing, she guides his tool to the board. Pressing firmly with her hand, she forces him to make a cut. The next cut comes easier, and the next one even more so, until Claire removes her hand from Don's. He's carving on his own now, switching tools only when necessary, pulling shavings from the smooth curves of the river, digging deep into the wood for places he wants no ink to show. Before the thing is finished Don's shoulders begin to heave. He knows if he had wanted to do something for Bev, it should have happened a long time ago. He starts to weep. Claire wraps her arms around him and he drops the tool. "It's too late," he says. Don takes the piece, walks to the living room and tosses it into the woodstove. They sit in silence, watching the flames, steadying their breath until night falls. Jessica Hahn is a graduate student of fiction at Emerson College in Boston. She edits nonfiction at Redivider and spends her student loans on books, organic food and expensive cocktails. She prefers pop machines to soda machines, and misses her family dearly.